Facebook giveth, and Facebook taketh away – and then giveth a little more. Close on the heels of its announcement that it will be reducing the amount of publisher content users see in their news feeds, the world’s biggest social network is wooing them again with a new feature allowing users to send each other links to Instant Articles in its popular Messenger function. The new feature, announced by Facebook in a blog post on Thursday, is first rolling out for mobile devices with Android operating systems, with iPhone support coming in the next few weeks. Messenger users who click on Instant Articles will enjoy the same accelerated load times for Instant Articles available elsewhere. Facebook will identify content with accelerated load times with a lightning bolt, appearing in the upper right hand of the Instant Articles link in Messenger. This integration replaces a previous system, in which links shared via Messenger loaded in a mobile browser, typically a much slower load time, especially with low connectivity. 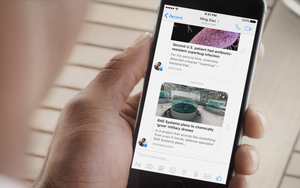 The new feature opens the Instant Articles within the Messenger app using Facebook’s technology, which hosts the publisher content directly on the Facebook platform. Like Facebook’s previous attempts to woo publishers, the Messenger integration will doubtless stir concerns that publishers are handing too much control to Facebook, which serves as a gatekeeper for their audiences and the delivery channel for advertising sold against their content. As noted, Facebook recently revealed that it is tweaking the algorithm governing which content shows up in user’s newsfeeds, reducing the amount of content from publishers in favor of more content from their Facebook friends. The new system prioritizes personal content over news and information, which in turn, takes precedence over entertainment content, as set forth in Facebook’s summary of the “values” determining which types of content get the most exposure. It covers all types of content from publishers, including article links, video, and live video. Alarmingly, a number of studies by online analytics firms indicate that publishers’ Facebook audiences were already decreasing in size even before the algorithm change took effect. 1 comment about "Facebook Woos Publisher Back With Instant Articles Feature". J S from Ideal Living Media, July 15, 2016 at 5:36 p.m.
Facebook could become THE place to see your crazy relative's political rants, and that's about it. If YouTube can share revenues with publishers, despite their much higher delivery costs, Facebook could -- and should -- too.